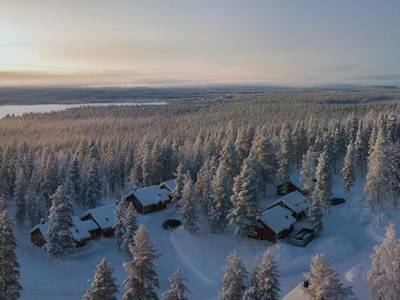 With cosy hotel rooms and delightful winter cottages surrounded by a sublime winter landscape, Jeris in Finland is the perfect retreat. 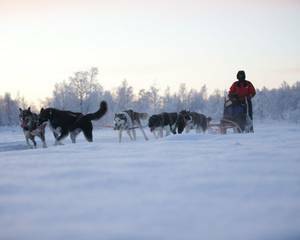 This 7-night holiday includes Arctic activities such as a thrilling snowmobile adventure and an unforgettable overnight dog sledding experience in a wilderness cabin. 23rd and 30th December departure dates are based on winter cottage type A-accommodation. Supplements apply for cabin accommodation on all other dates. This winter holiday in Finland has been one of our most popular trips for over a decade and a quick look at the activities we include highlights why. 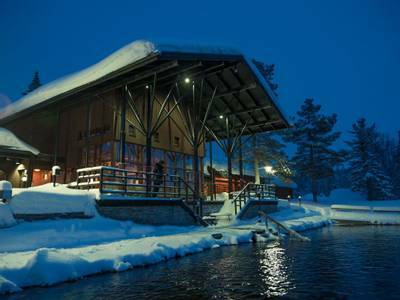 Firstly, guests enjoy a cultural experience at an historic reindeer farm, where a reindeer-pulled sleigh ride is a wonderful introduction to Lapland and the small museum provides details of the local culture and times gone by. 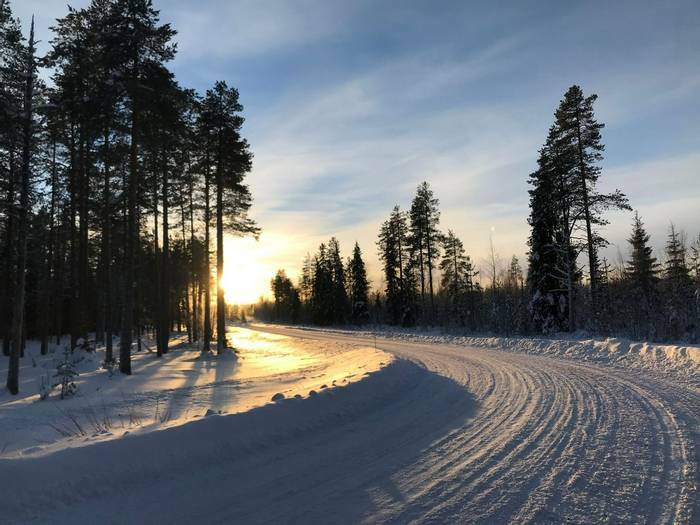 A thrilling snowmobile safari is next on the list and gives the chance to explore further afield and gain a sense of the scale of Finland's wilderness environment. This is not a short taster session – you will cover between 60 and 80km during the day! The true highlight for many people, however, is the overnight husky safari to wilderness cabin which covers two days of the holiday. This is an unforgettable experience for all who take part and is a real adventure. We also leave time for you to tailor your holiday and relax at Jeris or enjoy additional activities such as cross-country skiing, snowshoeing and ice fishing. We can also arrange for you to spend your final night in a winter village or in a spectacular Aurora dome at nearby Torassieppi. Suitable for: Anybody over the age of 16. See our terms for further information. Upon arrival at the airport, you will be transferred directly to Jeris where you will check into your accommodation; either in a hotel room or winter cottage. Once you have settled in, a welcome dinner will be served and you will meet with your guide to discuss the adventures ahead. Your cold weather clothing will be provided and is yours for the duration of your stay (if you arrive on a late flight, this will take place the following morning). Reindeer and Lapland are synonymous with each other and today you will gain an insight into the daily life of a reindeer herder as you visit a nearby reindeer farm. The farm is also home to a small museum which showcases the customs of reindeer husbandry and its ties to the culture and economy of the region. You will be shown how to throw a lasso and will then enjoy a delightful 7km reindeer-pulled sleigh ride. This is a magical experience and lunch will be served around an open fire. This afternoon you will head back to the hotel where you can enjoy a sauna, either at the hotel or in your winter cottage. Snowmobiles are a common mode of transport in Lapland and are used to travel between remote communities. 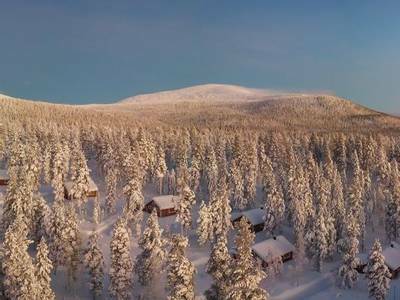 They are also exceptionally good fun and offer guests the chance to travel further afield to explore the landscapes of Lapland. You will be given a full safety briefing and instructions before you head out on the trail, travelling two people per machine, for a safari that will cover between 60 and 80km of pristine landscapes. You will travel through snow-laden forests and across frozen lakes and rivers as you delve into the heart of the wilderness. You can swap drivers during your safari (providing you both hold a full driving licence). 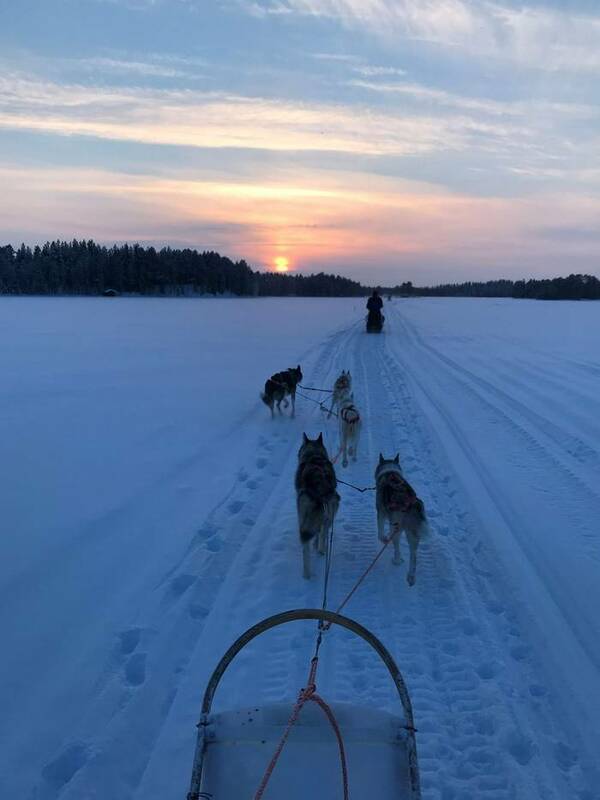 There is nothing that can quite compare to the sense of adventure you feel as you drive your own team of huskies through the wilds of the Arctic (one person per sled). This holiday takes things a step further than most as you enjoy an overnight adventure with your team and stay in a wilderness cabin. 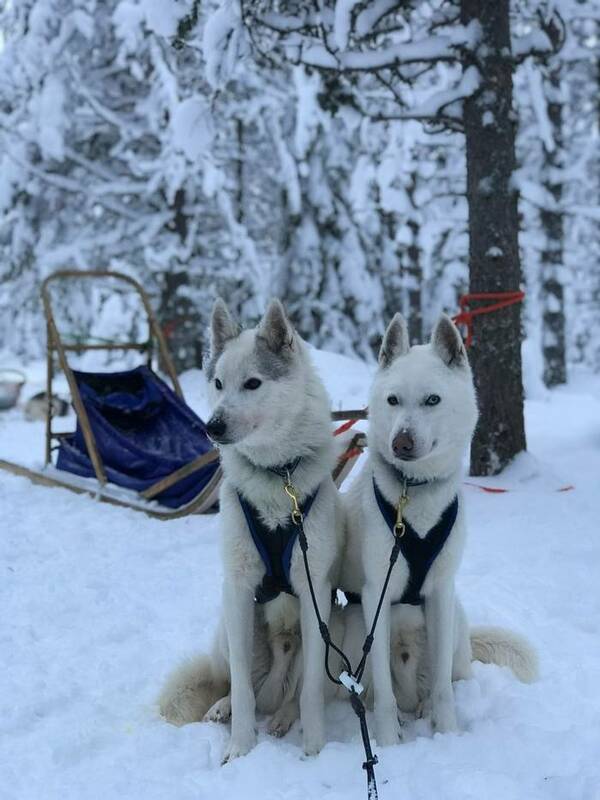 After checking out of your hotel room, you will meet your own team of between 4 – 6 huskies at a nearby sled dog centre and will help to harness them under the expert tuition of your musher guide. When the sleds are loaded there will be a full safety briefing provided before your guide leads you off to start your adventure. You will be sure to notice the dogs’ enthusiasm for the trail; their excitement is infectious and their happy howls and barks highlight their desire to get going. Once you have released the brake on the sled the dogs fall silent and focus on the task at hand. You will drive your team and cover around 25km today (depending on conditions) and lunch will be served around a campfire en route. Your destination is a wilderness cabin in a remote corner of this stunning landscape. Upon arrival at your base, the group will all work together to collect wood and water as needed. Your guide will prepare the evening meal, light the fire and get the wood-fired sauna on (saunas are basically mandatory in Finland, even in the wilderness). Your priority will then be to feed and settle your team of dogs for the night. The cabin you sleep in will be determined by the route and the conditions. Most do not have running water, electricity or indoor toilet facilities and accommodation will be dormitory style. 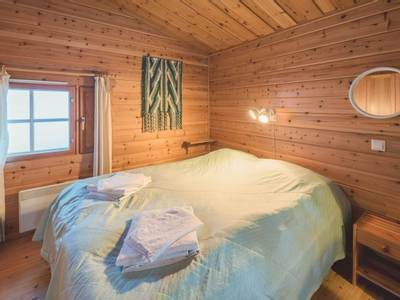 This is a rustic experience but you will be cosy in your arctic grade sleeping bag and, once the fire is blazing, the sauna is warm and your dinner is served this is sure to be an unforgettable overnight. Another bonus is that this remote location is far from any light pollution and so provides an ideal place from which to view the Northern Lights should conditions be favourable. You will awake this morning to what sounds like a pack of wolves outside, fear not, it’s just the dogs eager to get going once again! You will enjoy a warming breakfast before setting off with the team again. There will be time to further your mushing skills as you travel around 25km and head back towards the sled dog centre. It’s sure to be a sad moment when you part from your team but, back at Jeris, you will enjoy a delicious meal and hot shower which will hopefully provide some consolation. We have left today free to spend your way, whether just relaxing in these peaceful surroundings, taking advantage of one of the saunas or enjoying additional activities. There are plenty of options on offer including additional snowmobile safaris, Northern Lights hunts and ice fishing. These can be booked in advance through us or can be booked and paid for locally (subject to availability). As part of this package, you also have free use of cross-country skiing equipment or snowshoes for one day, so why not head out into the wintery landscape to give one of these a try (some prior experience of cross-country skiing is recommended). Please note: during our 23rd December departure, activities are only bookable and payable locally and only Northern Lights activities are available to add-on. Today has also been left free so that you can try additional activities or make use of the free cross-country skiing equipment and snowshoes and explore the area further. Tonight you will enjoy a special farewell dinner, reliving the highlights of your stay with your fellow guests. 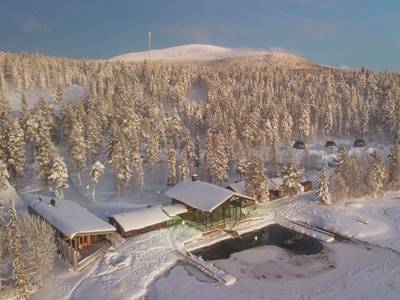 If you want to spend the night in true style then we can also arrange for you to upgrade to a snow room at Torassieppi Winter Village or to one of the spectacular Aurora domes (please see the ‘Personalise’ section for details). Today you will say farewell to the delights of Lapland and you will be transferred back for your return flight home. Alternatively, we can arrange for you to explore the bright lights of Finland’s capital with a stop off in Helsinki en route back home. Details of all of the extensions can be found in the ‘Personalise’ section of the holiday page. 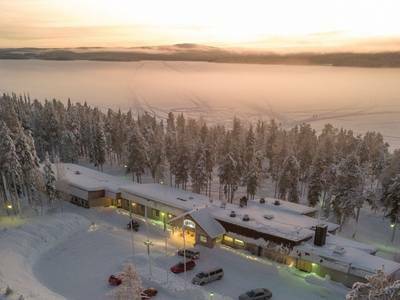 Hotel Jeris occupies an enviable location which is 20 kilometres from the nearest village and is located directly on the shores of Lake Jerisjärvi. It is this remote position that makes the hotel an enchanting forest retreat, with the amazing backdrops of the forested fells and frozen water. 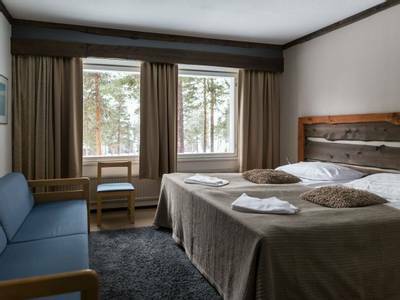 The hotel is owned and run by the Pietikäinen family, who also manage the neighbouring sister hotels of Harriniva, Kittila, and Torassieppi. 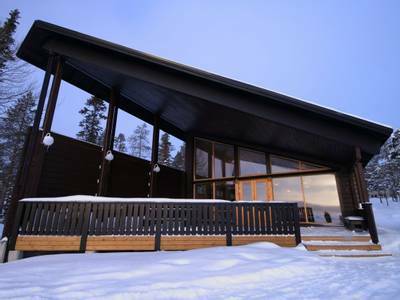 Their hotels are some of our most popular accommodation options in Finland, having received high praise for their knowledgeable guides and exciting activity options. The hotel consists of a central building and 32 winter cottages in the adjacent forest. 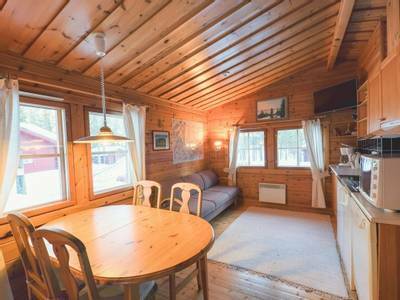 Your meals will be served in the hotel restaurant, which offers a rustic menu of traditional and local Finnish dishes. Meals are served buffet style with one or two options for each course. Guests can enjoy local delicacies, such as salmon and reindeer. The hearty food here is ideal for setting you up for your adventures in the snow. There is a small lounge area where guests can relax in the evening and take advantage of the hotel's free Wi-Fi. Tea and coffee are also available for guests at reception (payable locally). If staying in one of the hotel bedrooms, we would advise taking a travel kettle. The Arctic Spa pools are a very popular feature and can be found on the lakeshore, a short walk from the main hotel building. The two small spa pools offer a delightful view over the frozen lake. 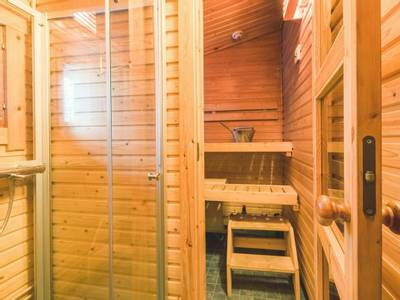 There are two saunas (including a traditional smoke sauna which is heated twice weekly). For those who wish to experience a Finnish tradition, there is also an illuminated ice pool to take a dip in following the sauna (you do need to be in good physical shape). Guests staying in either the cabins or the hotel rooms normally have one spa entry per holiday included. If you wish to visit more than once then this can be arranged and paid for locally with reception. A small selection of souvenirs is available for guests to purchase (including postcards and local handicrafts and snacks) in the reception area. 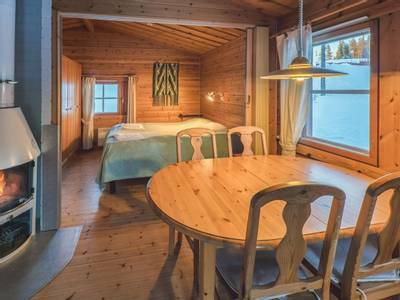 Double/twin rooms: In the main hotel building at Jeris there are 27 comfortable traditional bedrooms. 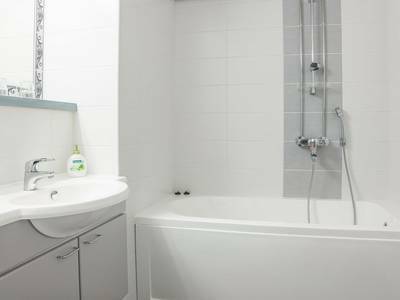 All guest bedrooms have an en-suite shower room, a drying cupboard and a television. Please note: A limited amount of hairdryers are available from reception. There will be the option for you to arrange additional activities locally during your holiday. Your guide will discuss the possibilities with the group as the available options can change and the order of the main itinerary is also subject to amends. If, however, you know that there is an activity which you would like to try and include before you travel then please let our travel experts know at the time of booking and we will do our best to try and secure this for you in advance (subject to availability). Please note: Departures on 23rd and 30th December are based on Winter Cottage A accommodation. All other dates listed are based on hotel room accommodation. If you wish to upgrade to a Winter Cottage during these dates, please contact our Travel Experts for a quote. The minimum number of participants is 4 and the maximum is 12. Read more advantage. I was a little unsure of what to expect coming from Australia and never having done anything like this before. It was such an enjoyable experience and I will be recommending Artisan to anyone that may look at going from here in Australia. The two day husky safari. It was the best thing I have ever done. Great instruction and guides. Read more giving advice prior to booking the trip and afterwards. Read more felt like we were really out in the forests and lakes on our own, there weren't lots of other groups that we bumped into and it gave a really authentic feel to the holiday, which I know is important to Artisan! Our Jeris Adventure was absolutely brilliant and genuinely gave us so many unforgettable experiences. The highlight had to be the overnight husky safari. Crossing a frozen lake in the wilderness with our dog team in brilliant sunshine in -30 centigrade temperatures was an experience that truly brought tears to our eyes. Thanks to everyone involved for making our week such a fantastic experience. The most enjoyable activity was the 2 day husky safari. However all activities were great. We were blessed with 3 great guides. The holiday was tiring but excellent. Read more so was the snowshoeing and cross country skiing. Everything was excellent with great accommodation & very helpful staff at Gulo Gulo where nothing was too much trouble. Read more hotel were wonderful. They made us feel very welcome and nothing was too much trouble for them. The hotel was well equipped and staying there was like being a part of a small, close knit community. We would love to go back. The whole experience was everything I dreamed it would be and so much more. For me the snowmobiles topped it. An incredible day and one that I will never forget. Read more friendly and helpful. The whole experience was magical, but the 2 day overnight husky tour was everything I hoped for. The holiday was designed perfectly with just enough time to enjoy all the activities, which were equally fun. If we had to choose the huskies certainly made our holiday special. The craft making was also unexpected and a lovely addition to the program. A pleasure all round, and would definitely consider another similar holiday. Excellent handling from all staff involved, both at UK end in planning, and in Finland during the holiday. Many thanks. Read more loads of snow and blue-sky days, so the views across the lakes and forest runs were outstanding. The husky dog safari was amazing - to be at one with nature, and with our pack of huskies, to feel their power and eagerness to run. It was magical being in the middle of nowhere and the overnight cabin was a great opportunity to get to know our group. Read more luxury accommodation. The food is good and there is a cosy bar for relaxing. Read more steep mountains and tricky woods - all possible with our local guide. 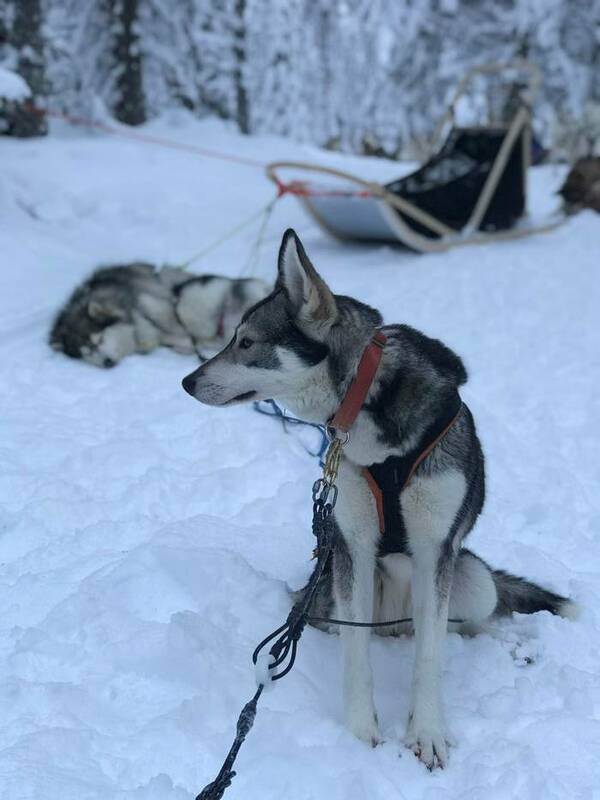 The two-day husky ride is also a proper immersion into being with these wonderful dogs in their natural habitat - you return to the hotel suitably tired but refreshed by this unforgettable experience. The Hotel Jeris is on the lake with a superb wood sauna, spa and other saunas - so ideal for plucking up courage for the challenge of swimming in the lake. Cross-country skiing is also straight from the hotel - across the lake for the absolute beginners or the more challenging undulations of the neighbouring national park if you feel so inclined. We were lucky to see the Northern Lights - apparently the best show all winter, so we felt very fortunate. 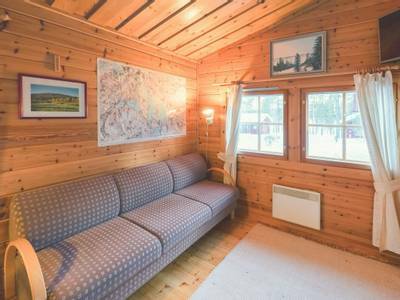 We would recommend a lakeside cabin - the absolute peace and quiet of being wrapped up in a snow-covered landscape is truly memorable and the en-suite sauna means that there is no excuse for not embracing yet another new experience. The husky safari was an immersive and hands-on wilderness experience with very well-behaved dogs. It felt really thrilling to be driving across frozen lakes and through snow-draped forests. The holiday exceeded our expectations and we had a wonderful time throughout. Thanks are due to all the very hard-working staff. Read more similar ages, with similar aged children (twenties). VERY, very well done and thank you. Northern lights on New Year’s eve in full flow, with champagne and fireworks, stood on a frozen lake - and as for the huskies!!!! I'm going to book a warm adventure now. Thank you so much. Our holiday was fantastic from start to finish, we didn't want it to end. 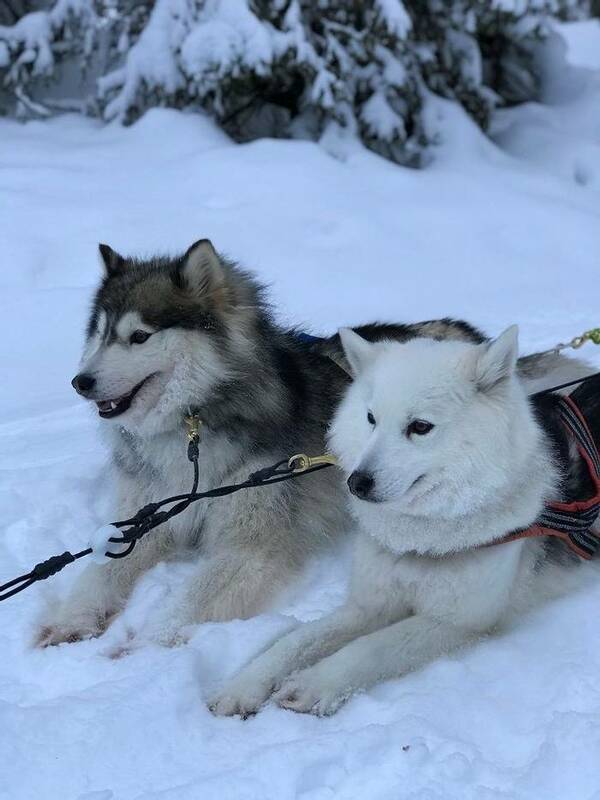 The husky safari was magical and the overnight stay in the wilderness cabin really helped our group to connect. The snowmobiling was exhilarating and you really got to tour around the countryside, just amazing. It was all pretty perfect to be honest. We are planning to rebook for next year. Read more Unique and fun activities, we felt safe when with guides and reps.
Read more lovely, gave great info and took lots of group pictures of us. Equipment was in great condition and even skis were well looked after. The food was plenty and great choices. Main dishes all week long were of great quality and flavour. A fantastic gesture was the birthday card and bottle of wine I received whilst at dinner. Great attention to detail, a lovely surprise and hugely appreciated. On my actual birthday, my partner arranged for a little cake with Katrina which again was not a problem and delicious. If pushed, I would say the day out on the snowmobile was the most enjoyable but as mentioned above, every day was great. Our two free days were spent with cross-country skiing across the frozen lake and with a relaxing spa visit (and dip into the lake). All the activities were brilliant but nothing beats handling the huskies. The whole holiday was fantastic. Thank you. (Favourite activity) – 2 day husky safari. Overnight and having to help harness the dogs and feed them, etc all added to the experience and adventure. I thought the reindeer ride/experience was fantastic as this is not something that is readily available and accessible which makes the activity much more special. For me (the least enjoyable) was probably the snowshoeing and that was because it was quite hard work! The walk was brilliant and there was nothing wrong with the trip. Overnight husky safari and snowmobile trip brilliant. Nothing was unenjoyable - enjoyed all of it. Favourite activity? Husky safari. Riding through the snow, controlling your own dogs, it was so special and magical, we will never forget. Least enjoyable? Nothing, loved every minute of it. You wished me a fantastic trip. It was more than fantastic and my daughter and I had such a wonderful time. The programme of activities was superb and we had some terrific sightings of the Aurora. So much of this was due to our wonderful guide, Thomas. His enthusiasm and love of the area was so obvious and we learnt so much from him. He went out of his way to ensure we had a good time.